Quinoa seedlings have a low tolerance for cold, so wait to plant until after the last spring frost has passed. Mature plants are easier to harvest after a light frost in the fall. Before planting, amend the soil with a light application of a balanced organic fertilizer. Plant in spring, just after the last frost, by sowing seeds barely covered with soil in uniform rows. Keep soil moist until the seedlings sprout. Weed by hand until the plants are 4 inches (10 cm) tall, gradually thinning plants to 18 inches (46 cm) apart. As the plants grow, they will shade out most summer weeds. 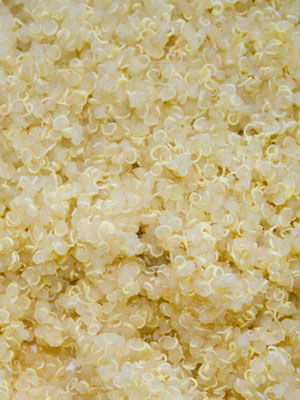 Quinoa is closely related to the weed known as lambs’-quarters, so it can be difficult to tell the two plants apart. Quinoa grows to 4 feet tall (1.2 m) in dry climates, but can grow twice as tall with abundant rainfall. Tall varieties may need staking to hold them upright when they become top-heavy with maturing seed clusters.